Happy weekend everyone! This is a great weekend recipe for lunch, a snack, or while chilling out watching a football game on TV. 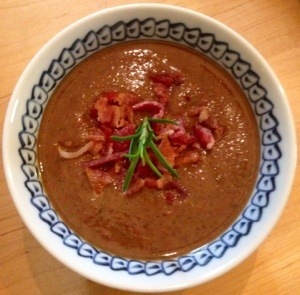 The first time I made this, it was an attempt to recreate a black bean soup that one of our favorite restaurants serves. I didn’t get it quite right the first time, but still loved it. I’ve tweaked it a few times since then, though. Here is where the recipe stands as of now (it might change again!) I think the red pepper gives it a bit of unexpected sweetness, which I really like. What’s also great about this soup is you can give it different twists with different garnishes. In a large soup pot, cook the bacon until crispy. Remove the bacon and set aside, but keep the fat in the pot. Set the pot aside if your other ingredients aren’t prepared yet so the fat won’t burn. 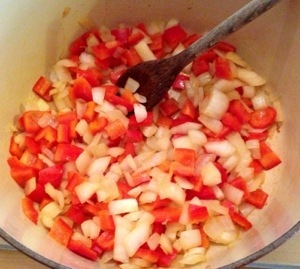 Add the red pepper and onion to the bacon fat along with a splash of vinegar to loosen all the bacon bits from the bottom of the pan. Add the garlic clove and some salt and pepper and saute for 6-8 minutes until the vegetables soften. To limit the spiciness, you can add the jalapeno with the pepper and onion, or wait until later in the process. The later you add the jalapeno, the hotter it will be in the soup when it’s done. 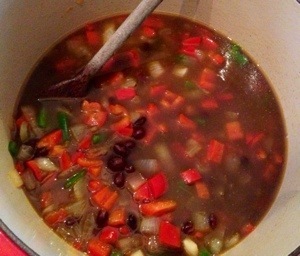 Add the can of chicken broth, the can of black beans – including the “juice”, the rosemary, and the thyme. Simmer another 15-20 minutes. If you have a hand blender, puree the soup in the pot, or transfer in batches to a stand-up blender and blend until very smooth. Simmer as needed until the soup thickens as desired. Taste for seasonings at this point and if you want more heat, add some Northwoods Fire or some chipotle powder. Serve topped with the reserved bacon chopped into small pieces. You can also add a dollop of sour cream, guacamole or pureed avocado, tortilla strips, chopped pepper… really just about anything that sounds good! Hope you give this a try – let me know what you think and how you garnished it in the comments! This entry was posted in hors d'oeuvres, Lunch, Soup and tagged Bacon, black beans, Jalapeño, Onion, red pepper, Soup. Bookmark the permalink.